Nina Marie and Alex first met at the wedding of a mutual friend. They soon found they both had a love for the stars above, especially the moon, so the natural choice for their offbeat wedding was a celestial theme. They wanted a dark and moody October celebration that balanced non-traditional and classic wedding elements. Their mutual love of donuts inspired a pink donut truck outside the venue for guests to enjoy after dinner. Even their cat made an appearance, in the form of a cardboard cutout, sitting amongst the guests during the ceremony and later being passed around the dance floor! Downtown Tampa provided one of a kind murals, unique to the city, perfect for posing for photos. 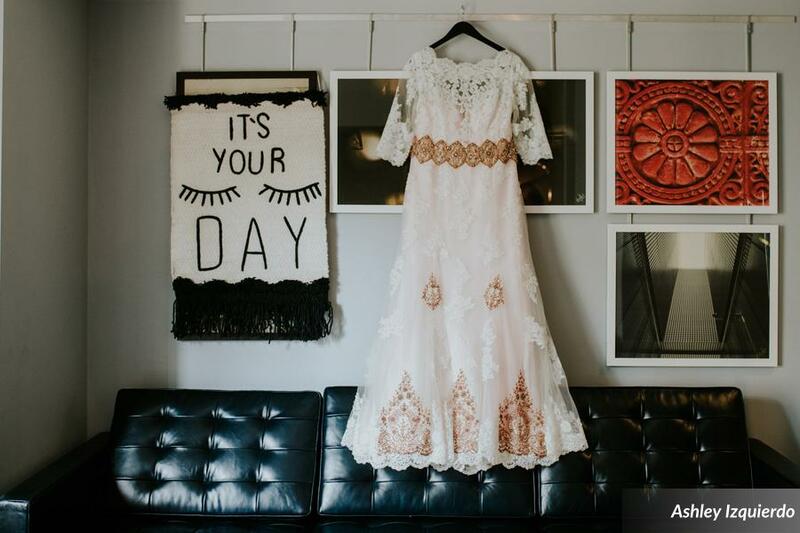 Having trouble finding a unique dress she loved, the bride bought a traditional wedding dress and had a seamstress modify it with custom blush tulle underlay and bronze appliqués. 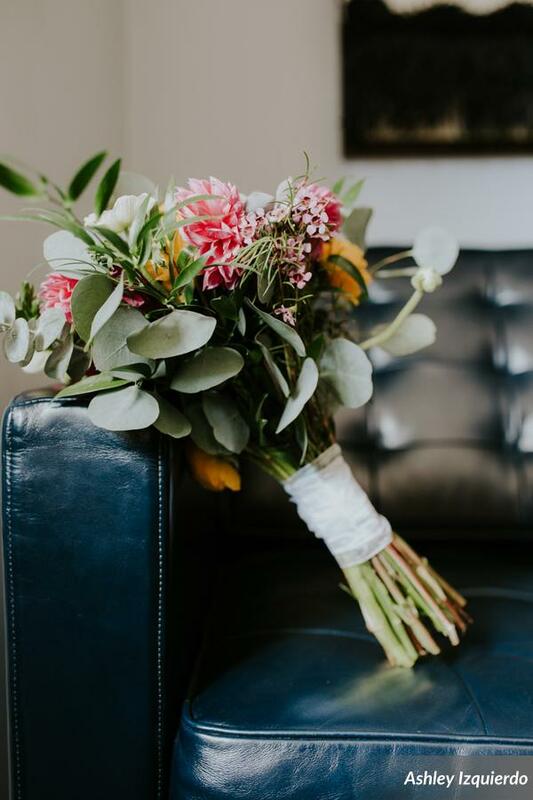 Bright, organic bunches of florals popped against black bridesmaids dresses and linens. The open space, exposed brick, and industrial elements of this 1920's theater created the perfect combination of unique yet romantic charm. 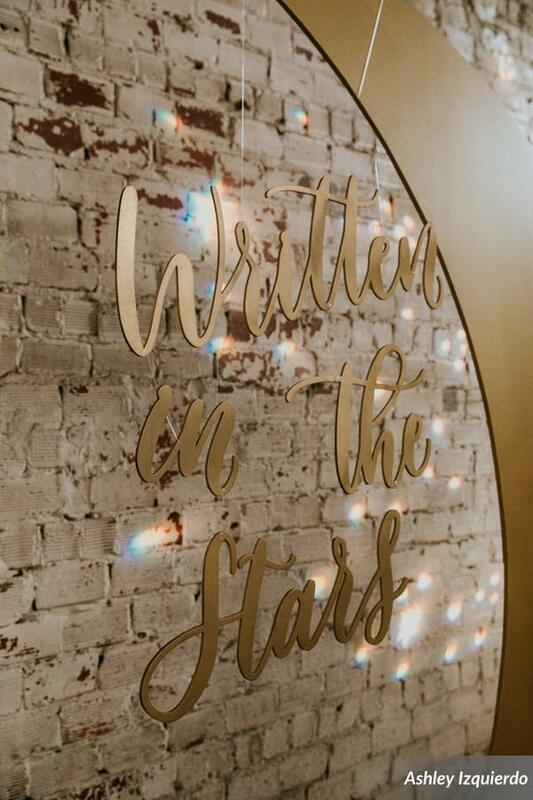 The couple had a custom golden crescent moon made for their backdrop, accented with a star sprinkled gobo on the exposed brick, and bistro lights overhead to simulate stars above. A black and gold sign accented with matching florals welcomed guests and let them know this was going to be an intimate, unplugged ceremony. The couple had a close friend officiate and do a reading of their favorite bible verses. The stunning couple, looking elated, as they are received by guests. To stay in theme, the wedding party wore black attire, with the maid of honor in a custom embroidered gown. The bride had a baby pink bomber custom embroidered with 'Just Married' and celestial themed patches. For a unique getaway, the couple bought a tandem bike, and attached a sweet basket and 'Just Married' sign. 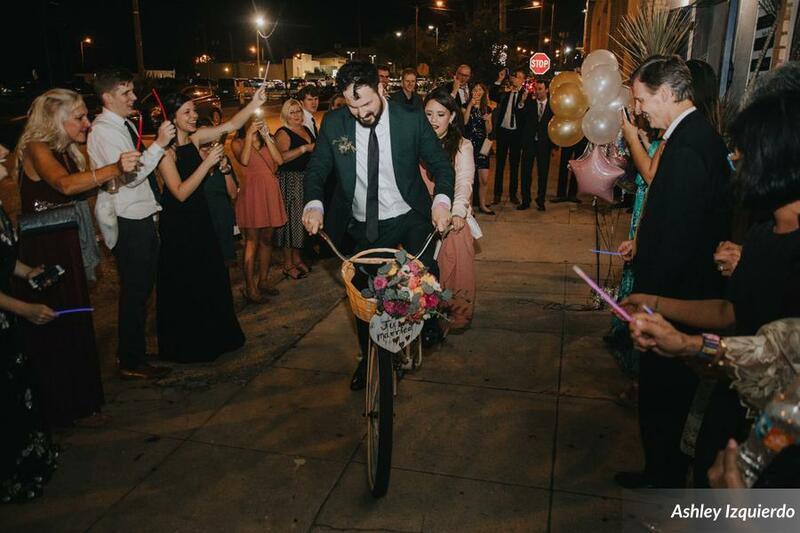 The couple was sent off on their tandem bike, surrounded by waving glowsticks! Lovebirds Buffy and Dave’s intimate wedding was full of romantic, rustic details. The newlyweds exchanges nuptials at The Lange Farm accompanied only by their two children. Light tones of misty pink, ivory, and gold were reflected throughout the flowers and linens. The couple chose a “Naturalistic Love Nest” style, tying in vintage furnishings and décor, glowing candles, and lovebird accents like feathers, nests, and metal birdcages. After the newlyweds sealed their vows with a kiss (with an adorable look of awe from their daughter and amusing grimace from their son), they shared a special first dance under the canopy of Oak trees. Delicate miniature bird nests tucked into branches created the seating chart, and the reclaimed wood dining table was lavishly decorated with a Spanish moss runner, pedestal bird cages, terrariums of flora, and an abundance of candles. Place settings of layered chargers and vintage china were topped with organza napkins in metal finch napkin rings. The new family enjoyed a light meal of delicious hors d’oeuvres, and the children filled printed kraft bags at the trail mix bar before partaking in the dessert display – a vintage hutch featuring butterscotch-nest topped cupcakes displayed in teacups and vintage china stands, and a wedding cake adorned with a suspended birdcage ornament topper.